“Relax, it’s just 230 kms!! You will reach there before dawn my friends” – Cyril said who had come to India just 2 months before, for an internship at Alliance Française! It was not actually his fault when he thought we would drive at a speed of 50km/hour and it would take us nearly 4.5 Hrs. Much to his dismay, we made him realise that he was driving on Indian roads in a Tata Innova and thus we should manage our expectations accordingly! It took us nearly 7 hours to reach our destination, including little breaks we took at small Dhabas for Chai and snacks. By the morning, we had reached our tent accommodation. We decided not to stay in the fancy hotels but by the side of Ganges for authenticity, a peaceful ambience and of course the spirit of adventure. “Are not there any locks in these tents? How can we leave our expensive stuff in here while we go out?” Cyril cried out! Well it’s natural to doubt the security measures in such camps as there were no barriers or security guards to ensure the safety and security of our belongings. Sanjay, our accompanied guide who is also the co-owner of the camp as well as the rafting instructor, told us that there were hardly any locks since running away is a difficult task in the mountains! After the 7 hour journey, as much as we were dreadfully tired, we were equally excited to hit the Phool Chatti waterfall. Of course, there was a normal path to it, but we chose the adventurous one. After the short and challenging trek, we reached by late afternoon and enjoyed a cool shower. It was indeed refreshing. Sanjay clicked loads of photos with the cameras we handed over to him. By dusk, we came back to our tents and decided to explore the camp area. We found some luxury tents too, but thought it better to stay in the authentic ones. 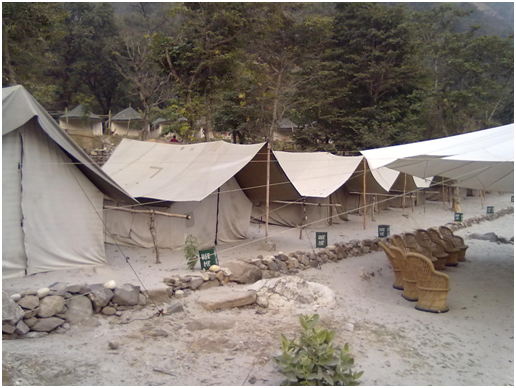 We also discovered the recreational area of the camp housing a volleyball court, a trampoline and a badminton court. By 7 p.m. we were served some snacks that included peanuts, mixed Indian pakode and of course the chilled drinks we requested for. We were delighted to see the proactive attitude of the staff in arranging everything right on time with our minimal involvement. Soon, the bonfire was set, dinner was served and music was on, not to forget, by the side of the Ganges. It was heavenly! 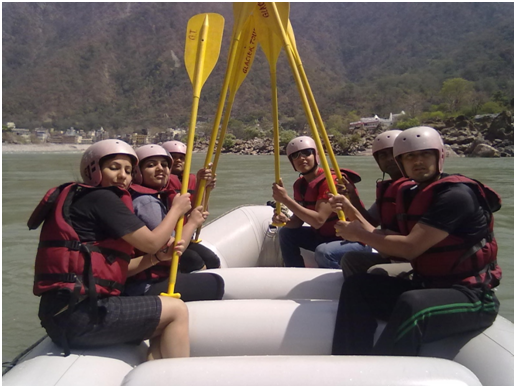 We were all set the next morning for our much awaited rafting excursion. We reached the destination and saw hundreds of people in harness with their rafts. We were given a short briefing by our rafting Instructor and we started our 16km rafting journey. I was glad that we went there in the month of September. It was slightly hot and humid, however since this period is post the monsoon, we experienced some thrilling and huge rapids. It was exhilarating! 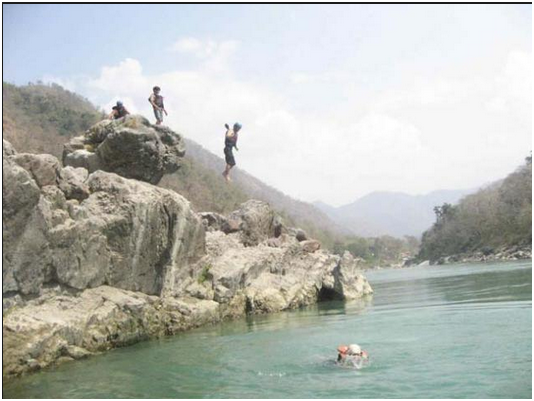 On our way, we took a halt where the camp was serving “masala maggi” and people were diving into the river. The environment was thrilling. Friends and families had gathered there to click pictures, enjoy the tea and of course the hooting did not stop even for a second. One after the other, people dove into the water from a height of 10-12 ft, and it felt like a competition was going on. Tired and tanned, we came back to our tents. The rafting experience had drained out all of our energy and we could do nothing but hit our beds. In the evening, after our early dinner, we got back into our car for another 7 hour journey. The drive back was a lot different. Instead of incessant chattering we were all sleeping. 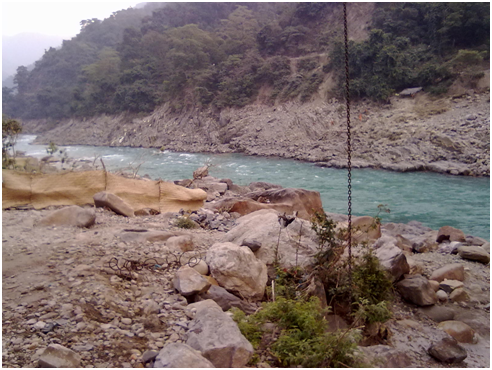 Although we were tired, we loved our short yet interesting and thrilling trip to Rishikesh. Visit Shanti Travel for more breaks away from Delhi! Next Post THE KINGDOM OF DREAMS!